DNG Maxwell Heaslip & Leonard has just brought to the open market a stunning luxury ready-to-occupy detached residence in the much sought after Carraig an Iolair development in Barna. Built in 2006, this property is part of a small development of 13 similar detached homes with a mature open green amenity area. Located on the Galway side of Barna, adjacent to the local primary school, this development offers privacy and convenience with easy access to all the amenities Barna offers, and just a short trip to Galway city. No 7 Carraig an Iolair is a fully fitted residence with the highest quality finish throughout including timber and extensive tiled floors, gas fired underfloor central heating on the ground floor, and radiators on the upper floors. Each of the rooms is bright, spacious, and well proportioned, offering stylish modern accommodation with neutral colour schemes thorughout the house. The garden to the rear is not overlooked and there is a paved drive and parking area to the front which overlooks the green area – a focal point for all of the children in the development. Accommodation includes an entrance hall with quality timber floor, and two living rooms with timber floors and feature marble surround fireplaces with cast iron inset and gas fires. The kitchen has a tiled floor and surrounds, solid maple kitchen units with granite worktops, kitchen island, integrated applicances with a Neff hob and double oven, fridge/freezer, extractor fan, and a door to the rear garden. The living/dining area has a solid wood floor and separate door leading to the utility area with tiled floor and plumbing for washing machine and dryer. There is a fully tiled guest wc with whb, a boiler room, and a cylinder room with a door to the rear garden. The cylinder room has a central vacuum point system. On the first floor, the landing comes with wood floor and a large shelved airing closet. There are four bedrooms on this level, all with timber floors and built-in wardrobes. The large master bedroom has a dressing room with extensive built-in wardrobes and shelving. It comes with a fully tiled en suite shower room with whb, Jacuzzi bath, shower unit, and separate wc. The third bedroom also has a fully tiled en suite. A fully tiled bathroom completes this level and comes with wc, whb, bath, and separate shower. 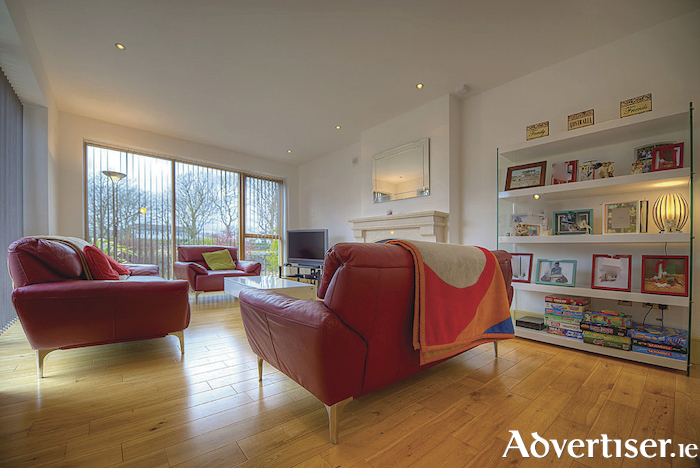 The second floor has timber flooring throughout and accommodates the landing and two large rooms. Bedroom five has a fully tiled en suite with wc, whb, and shower, and the games room, which could be used as a sixth bedroom, has extra built-in storage. DNG Maxwell Heaslip & Leonard is quoting an asking price of €750,000. For full particulars or to arrange a viewing, contact the sales team at DNG Maxwell Heaslip & Leonard at 091 565261.